This is such and adorable card. I used the Crop-A-Dile and the Coluzzle system on this one. The image is from Pun Fun Set. Which is a special right now till the end of the month. When you purchase it you get the coordinating wheel free. 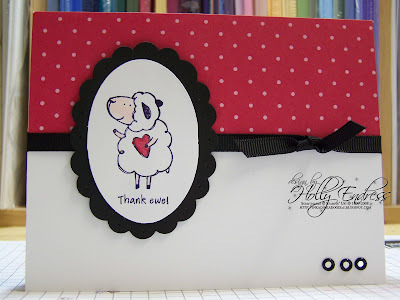 I used the Level 1 Hostess Print Pack, Basic Black & Whisper White Card Stock. Basic Black, Real Red & Blush Blossom Inks. Black Grosgrain Ribbon, Black eyelets and pop-up glue dots. Enjoy! !